Here at left, a fine piece of classic science fiction by a master. Some of us have been accused of being space cadets from time to time. I always like that accusation. Here in this book I remember reading and thinking that the author was lost about half-way through. I think he was. I think he was in a "walk around the room pulling at his hair and thinking of becoming a barber" type of lost moments. He toughed it out and so do we. I remember now thinking that the space business was far more exciting and interesting than the time on the planet. Why did he put the planet in play? It is occasionally fun to see the masters had a little trouble handling a plot that got away, also. I have a similar problem in a story I didn't reflect on adequately until tonight. I too have a fun and exciting environment full of interesting people and devices. Then, 1/3 of the way into the story I lock the protagonist in a room with a desk and another character for ... an interview. It's several thousand words of dialogue that are meaningful to me. They are not however the content promised after the first couple thousand words. I think they fail the "meaningful" test to anyone not completely in love with the protagonist. I need to rectify this issue. If I want the interview to transpire, let's make it a walking tour as the other character is "much too busy" to be tied to a desk. Indeed, he's far too busy and mysterious to be conventional so let's not make him an IBM blue suit. You can learn for masters if you think about what they did when they were in trouble. You have to find their trouble, and you have to think. Neither task comes easily. I learned something from Space Cadet thirty-five years ago. I learned something from it last winter when I devoured it on a plane. I learned something from it tonight. I hope you're learning. I know you are writing. 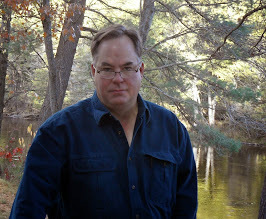 "He once wrote an adverb, just to see what it felt like." Dear J: You hooked me with this one. 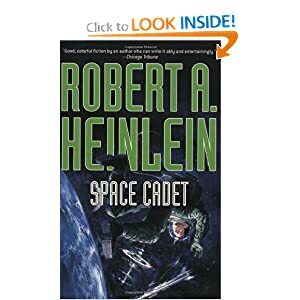 Robert A. Heinlein is perhaps the author I admire most. "Space Cadet" may have been one of the earliest 'juvenile' books he was contracted to write with his publisher. My absolute favorites in that genre are "Red Planet" and "Tunnel In The Sky." The latter, by the way, is much more engrossing to me than "Lord of the Flies." Thanks for the reminder. Yours truly, Toe. Awesome! I'm instantly taken back to a spring bed in an attic among the tree canopy - trying to avoid the still August night. Then, I'm on the station walking around the outside on my mag-boots. Glad to meet a fellow cadet.